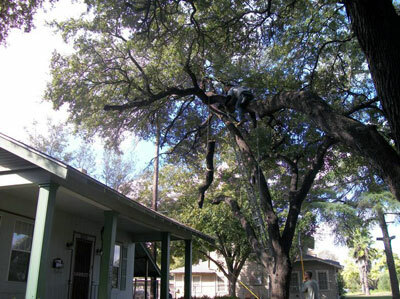 Above All Tree Service offers tree pruning in San Antonio. A question we will sometimes get is a simple one, but very valid nonetheless: is it really necessary to prune trees? We can only wish that more property owners would ask this question to a professional tree service expert before grabbing the shears, as it would save the lives of countless trees. Our answer tends to be 'yes and no'. There are many benefits that a proper tree pruning job can have on the tree. For starters, consider that less branches means better airflow through the tree which will help prevent disease and infestation. While those two can just as soon be caused by improper trimming, they can also be the consequence of the tree not getting enough fresh air and instead being forced to let bacteria thrive. Likewise, dead and diseased branches need to go as soon as they are spotted – unfortunately, removing the former and merely spotting the latter isn't all that easy. If you noticed a dead branch, you're probably right to remove it, but have you considered its position on the tree? Pruning branches that are too high up is a good way to seriously injure yourself and receive bone breaks in exchange for good intentions – let us climb the heights and trim the tree without anyone getting injured in the process. As for diseased branches, they're not always the easiest to tell from living ones – trees can be notably varied in appearance, and a patch that raises red flags on one tree could be perfectly normal on another. To know exactly which parts of your tree need to be removed due to infection, you'll need the help of a trained arborist with a near-supernatural knack for weeding out bad growth – fortunately, we have no shortage of those. And what about safety-oriented trims? We said that trimming dead branches can often lead to injury, but few pruning jobs carry more danger than those that try to prevent storm damage. These will focus on removing tall branches or even a tree's entire topside – it shouldn't come as a surprise that this translates to lots of accidents, including those that risk leaving a permanent mark on you. 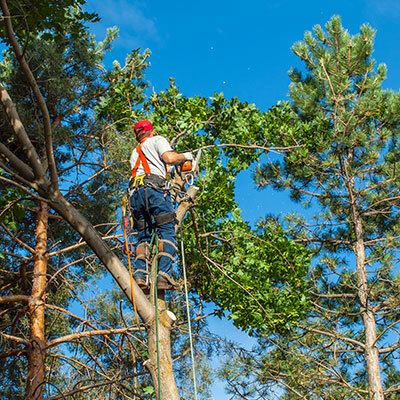 Don't risk your health just because you're not afraid of heights – our arborists will reach the intimidating heights of your tree without ever putting themselves in danger. There are other reasons still for wanting to prune past the seasonal, infection-subduing and preventive. A tree might have grown so fierce that it impairs the quality of life of people in the area – while we're always reluctant to trim healthy trees for growing too large, we understand that trees are meant to serve us just as well as we are them, and sometimes their growth needs to go. These are among the most delicate pruning gigs we get, which is why you can't afford to do it on your own – any time you're cutting off healthy branches is a time when you're putting stress on the tree and potentially subjecting it to illness.